By entering this site you acknowledge and agree to all terms and conditions stated herein and agree that this site will only be construed and evaluated according to laws of republic of India. If you use this site from other locations you are responsible for compliance with any and all applicable local laws. If you do not agree to these terms, do not use this site. 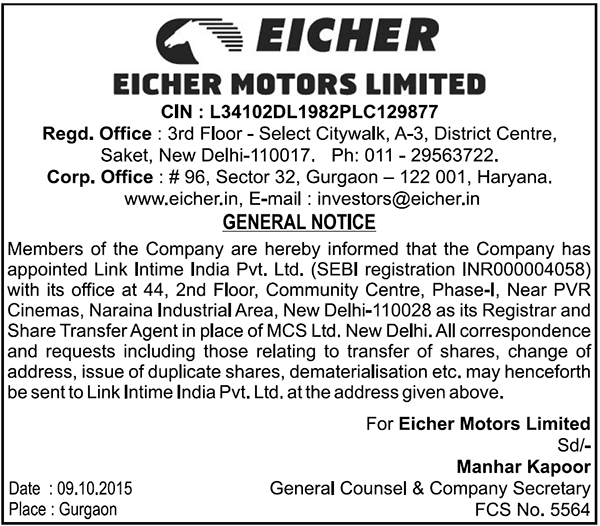 Eicher Motors Limited (hereinafter referred to as 'EML') is the copyright owner of everything on this site and no portion of this site, including but not limited to the text, images, audio or video, as may be used in any manner or for any purpose, without EML's express written permission, except as provided for herein. 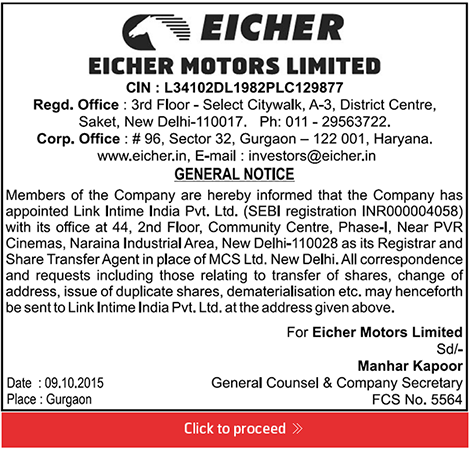 All the text, graphics and trademarks displayed on this site are owned by Eicher Motors Limited and used under licence by EML's affiliates. Without in any way waiving any of the EML's rights, you may download, print copy of this information on this site for your personal and non-commercial home use only, provided you do not delete or change any copyright, trademark or other proprietary notices. You are not authorized to distribute text or graphics to others, copy this information on any other server or modify or reuse text or graphics on this or any other system, without express written consent of EML. By entering this site you acknowledge and agree that any name, logo, trademark or service mark contained on this site is owned or licensed by EML and may not be used by you without prior approval of EML. Although the specifications, features and other information contained in the site are based upon upto date information and while EML makes all reasonable efforts to insure that all materials on this site is accurate and correct but no guarantee or warranty either express or implied including but not limited to implied warranty of merchantability, fitness for a particular purpose, title and non fringement, is provided as regards its accuracy, substantiality and completeness. It should not be relied upon for any specific purpose. No information on this site shall constitute on invitation to invest in EML or any of its affiliates. Neither EML and any of its affiliates nor their or their affiliate's officers, employees or agents shall be liable for any loss, damages or expense arising out of any access to or use of this site or any site linked to it, including, without limitation, any loss of profit, indirect, incidental or consequential loss. Do not post on this site or transmit to this site, any pornographic, obscene profane, defamatory libelous, threatening, unlawful or other material which could constitute or encourage conduct that would be considered as criminal offense, give rise to civil liability or otherwise violate any law or regulation. Although this site may be linked to other sites, EML is not directly or indirectly, implying any approval, association, sponsorship, endorsement or affiliation with the limited site, unless specifically stated therein. Your linking to any other off site pages or other sites is at your own risk. EML reserves the right to revise this legal information at any time and for any reason and reserves the right to make changes at any time, without notice or obligation, to any of the information contained on this site, including but not limited to automobile color, specifications, accessories, models, materials or other product or service features. By entering this site you acknowledge and agree that you shall be bound by any such revisions. We suggest periodically visiting this page of the site to review these terms and conditions. This agreement is governed by the laws in india, you hereby consent to the exclusive jurisdiction and venue of courts in new delhi, india in all disputes arising out of or relating to the use of the EML web sites. Unless otherwise specified herein, this agreement constitutes the entire agreement between the user and EML with respect to the EML web sites and it supersedes all prior or contemporaneous communications and proposals, whether electronic, oral or written, between the user and EML with respect to the EML web sites. A printed version of this agreement and of any notice given in electronic form shall be admissible in judicial or administrative proceedings based upon or relating to this agreement to the same extent and subject to the same conditions as other business documents and records originally generated and maintained in printed form.